MANILA, Philippines - Without a doubt, K-Pop has swept and captured the hearts of many Filipino fans. If you are wondering who the teenage group, tweens and even the twenty somethings are adoring these days, chances are they’ll tell you it’s the K-Pop groups. The K-Pop infatuation continued last week when Filipino fans rapturously welcomed another popular Korean boy band group BEAST and heartthrob Kim Hyun Joong of the hugely popular Korean soap Boys over Flowers (BoF). Hyun Joong and BEAST performed alongside with Pinoy pop groups, Pop Girls and XLR8 in a benefit concert for young unwed mothers billed K-Pop Meets P-Pop last Saturday at the Araneta Coliseum. Part of the concert proceeds went to the Abiertas House of Friendship (AHF), a non-government organization that supports women with children out of wedlock. In an interview, Hyun Joong and Beast said this advocacy means a lot to them and that’s why they decided to give part of the proceeds to the organization. Everytime a music video BEASE performed their hits Special, Bad Girl, Mystery, Oasis, EasyShock. A "kilig" moment at the concert was when Beast members sang “Oasis” while throwing away long-stemmed red roses to the audience. During the interview portion, Beast thanked their Filipino fans for the outpour of love and support and promised to come back again to the Philippines. Meanwhile, the P-pop counterparts XLR8 and P-Pop also gave outstanding performances proving that Filipinos is at par with the Korean idols. 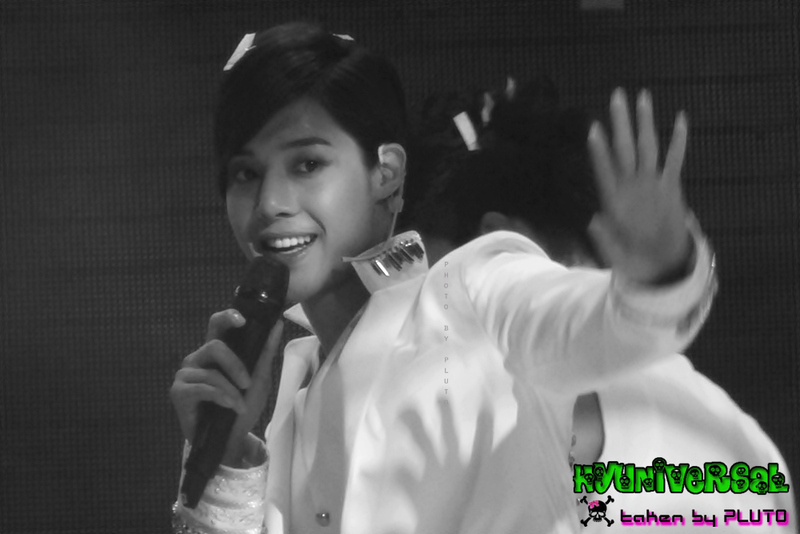 But the night belonged to the very handsome Hyun Joong. Filipino fans more than heartily welcomed Hyun Joong when he arrived at the NAIA last week. Michelle, 14, is impressed at Hyun Joong’s finely-chiseled looks, flawless skin and soulful eyes. But more than that, she likes how talented he was as an actor, singer and dancer. “Aside from that, he is very gentlemanly and refined. He is really gorgeous,” she said. At the concert, fans were cheering and chanting his name non-stop. When he finally came onstage, the crowd grew wild and loud with screaming. Hyun Joong performed three songs including the hit Please be nice to me. He became popular in the Philippines via the hit 2009 Korean drama series Boys over Flowers, where he plays the character of Yoo Ji Hoo, the charismatic gentleman of the F4 group. 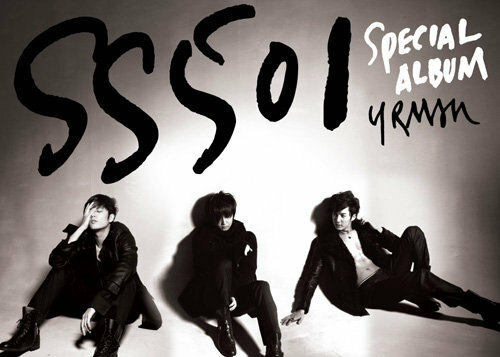 Hyun Joong is also the leader of the SS501 which produced popular hits like Because I’m Stupid and Making A Lover, which are both included in the OST of BOF. 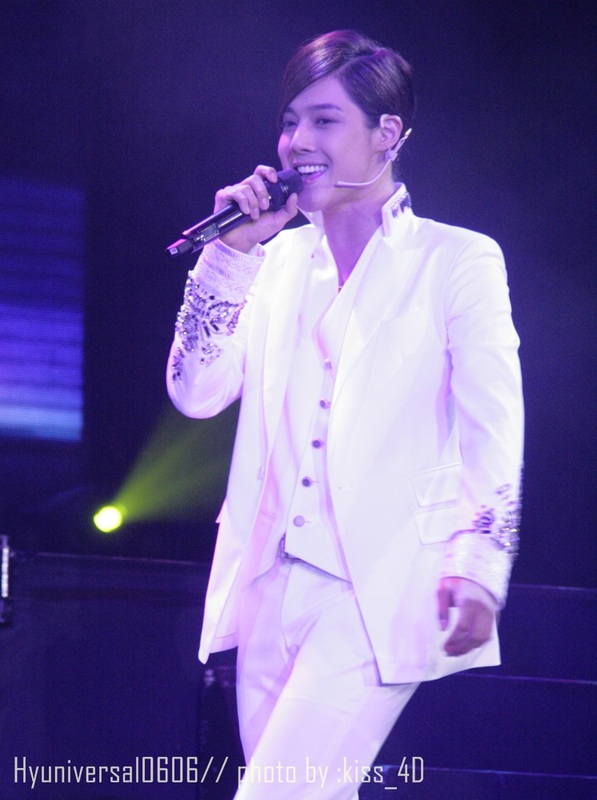 At the concert, Hyun Joong was dapper in an all-white suit and gamely answered all questions. Pinoy fans were touched by his sincerity and enthusiasm to familiarize himself with the country. When he was here, he granted a lot of interviews, held a fanmeet and guested in a noontime show. He said he wanted to get to know and eventually gain Filipino friends here. Hyun Joong endeared himself more to the fans when he spoke in Tagalog, especially when he said "Gusto ko kayo Makilala", "Kamusta Kayo", "Mahal ko Kayo" and "Maraming salamat po". Saying these phrases made the crowd went wild again. Asked if it he could like a Pinay and eventually have a girlfriend, Hyun Joong said he wants to get to know that somebody first and be friends and see where it would lead. He also said he was fascinated by the Philippines for its fresh air and wonderful nature spots. Hyun Joong also said in a previous interview that he is single at the moment. Asked what qualities he likes in a girl, Hyun Joong said he wants someone who could make him laugh and willing to be friends first. Another highlight of the concert was when the audience greeted him a happy birthday with matching cake to boot. Hyun Joong celebrated his 25th birthday last June 6. K-Pop die-hard fans Gelli de Belen and Candy Pangilinan brought the cake for him at the stage. Fans felt how much Hyun Joong appreciated the sweet gesture and they want him to come back to the Philippines soon. He was also asked if he knew there was a SS501 fan club here in Manila and he said he was surprised to learn there was and promised he would include Manila in their itinerary when their band tours Asia. The group’s official fan club in the country, Triple S Philippines were in full force at the concert. The most applauded or ear-drum breaking moment (due to the squealing) was when he sang his popular song Please be nice to me, looking so suave and well, cool in doing the dance moves. If anything, the concert proved how much Pinoy fans truly adore Hyun Joong. He promised his fans that he would come back to the country and try the food here and other stuff and also expressed his intention to do a drama. The night ended with Hyun Joong, the Beast, XL8R and Pop Girls singing Michael Jackson’s Heal the World with young students. Well, what else can I say? Everybody present in the concert last June 19 served as witnesses to this. The whole crowd was wild for Hyun Joong, shouting and chanting his name even until the very end of the show. He was indeed the highlight of the concert. And very well deserves all the adulation, not only because of his talent, but because of his amazingly good and generous heart. I hope Leader knows how much we Filipinos love him.